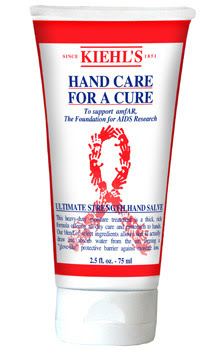 Today is World AIDS Day, and Kiehl's is getting in on the action with Hand Care for a Cure Ultimate Strength Hand Salve. Kiehl's partnered with amfAR, The Foundation for AIDS Research, to produce this limited-edition tube of the customer favorite. 100 percent of the net profits from each tube sold will be donated to amfAR. And while the fact that Kiehl's is donating so much to amfAR makes this beauty chick happy, it's the hand cream itself that's really got me going. The thick, rich cream is absolutely perfect now that the temperatures are dropping -- it staves off unsightly chapping, cracking and redness with ingredients that actually help to draw and absorb water from the air. It's formulated with a blend of avocado oil (a rich, fatty-acid emollient with Vitamins A, D, E and potassium), eucalyptus extract and eucalyptus oil (used to refresh skin), sesame oil (which absorbs easily and softens the skin) and shea butter (for added moisturizing and protection against dehydration). Best of all, the limited-edition tube features a unique design of the symbolic red AIDS ribbon so you can really show your support. It's created out of interlocking red hands that visualize the many hands that AIDS has affected, in addition to the many hands working together to find a cure.